The 5 things to know from the World Economic Forum on Wednesday morning. Richard Edelman quoted workers at the Edelman Trust Barometer Launch Breakfast: "It’s not an immigrant I fear – it’s a robot." Reskilling in an AI future was certainly top of mind among delegates in Davos. A new World Economic Forum report said employers can profitably take on 14% of the $34 billion reskilling bill – government will have to fund the remaining 86%. IPG CEO Michael Roth visited The Female Quotient lounge in Davos to talk diversity and women’s equality with Google’s Tara Walpert Levy. Roth showed diverse work for clients including Verizon, Ulta Beauty, and Canadian Down Syndrome Society and noted: "Purpose-driven work performs better in the marketplace, so there’s a business reason for doing this on top of everything else." Jennifer Temple, CCO of HPE, tells PRWeek editorial director Steve Barrett what she and CEO Antonio Neri get out of being in Davos this week, why it's so important for companies to communicate from a place of empathy, and how a corporation the size of HPE makes sure it's doing things the right way. As discussed yesterday, communicators are out in force at Davos, not just supporting their CEOs and C-suite execs, but also playing an important role in their own right. 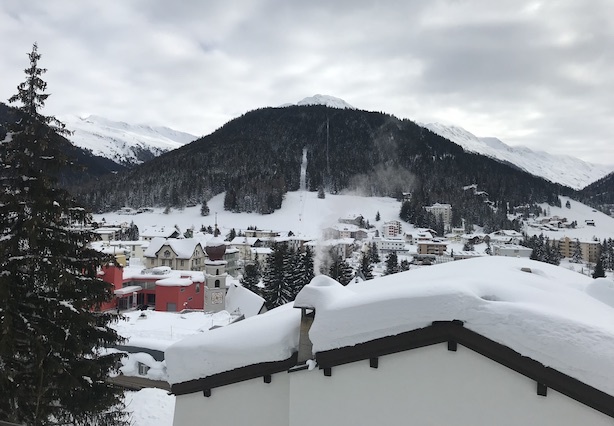 Over 100 PR pros gathered for the annual Davos Communications Dinner, courtesy of FTI Consulting, Heyman Associates, Brunswick Group, McKinsey & Co., Taylor Bennett, Adecco Group, and Copperfield Advisory. Former WPP CEO Martin Sorrell is a fixture at Davos but was not on the official attendee list for this year’s World Economic Forum. However, the now S4 Capital CEO was spotted Tuesday at a Wall Street Journal panel, but this year Sorrell seemed to be keeping a low profile and contented himself with a seat in the audience. He did do an interview with CNBC though. In other communications news to know on Wednesday: Behind the scenes of Payless’ fake luxury shoe store; Sard Verbinnen hangs on to top M&A global adviser spot; Giuliani on the hot seat, or not, after series of whimsical TV interviews; State of the Union could be moved outside of Washington.